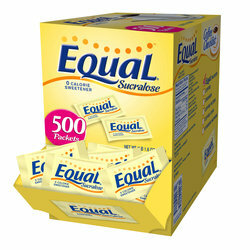 Equal Yellow (Sucralose Sweetener) 500 Count. Equal Yellow is the same sweetener (Sucralose) as Splenda. Each box contains 500 packets and the box also functions as a dispenser. Equal Yellow (Sucralose Sweetener) in a dispenser box. Less expensive alternative for your office coffee service needs. The same sweetener as Splenda, but still a name you can trust (Equal). 500 packets per box and the box also functions as a dispenser.